Sometimes a single doctor’s visit can save your life. At the age of 42, Carolyn Rodenburg was diagnosed with breast cancer after getting a mammogram at the urging of her friends. Rodenburg said that waking up after her double mastectomy was the most frightening and loneliest time of her life. 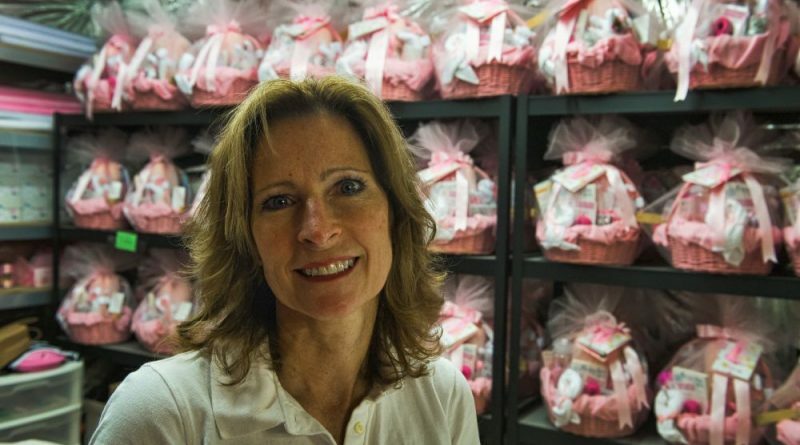 Today, as the founder of the IIIBs Foundation (pronounced “three Bs,” as in Bosom Buddy Baskets), the Leesburg mother doesn’t want any woman going through breast cancer to feel alone. The IIIBs Foundation sends large pink baskets to hospitals filled with things like back scratchers, small pillows, lanyards and a stuffed lamb that snaps on the car seatbelt to protect a woman’s chest after surgery. Though it’s only a basket, the true impact is in the community it creates. When women wake up after mastectomy surgery and see their baskets, IIIBs want them to know they are cared for, understood and have a line of support to other survivors. She contacted Rodenburg to thank her, and soon they were bonding over stories and mutual friends. “This group of woman really knows what you’re going through when you go through breast cancer,” Anderson said. The Bosom Buddies, as they are affectionately called, gather as often a once a week in Rodenburg’s basement to assemble baskets, and more importantly to talk. She says the women gain a lot from sharing their experiences with one another. They know that it is a space to cry and to help one another; it’s a therapy session. “The true magic of the IIIBs is the community dedicated to providing comfort to women going through breast cancer,” Rodenburg said. Karin Lindberg, also of Leesburg, was diagnosed with stage two breast cancer in 2010. She was taken aback when she awoke to the basket full of gifts, amazed that a stranger would give her something so thoughtful. The American Cancer Association recommends that women get an annual mammogram starting at the age of 55, but Rodenburg, Lindberg and Anderson, all in their 30s or 40s when they were diagnosed, all agree that early detection saved their lives. To raise the funds needed to send as many as 1,000 baskets a year, the IIIBs hold two major fundraising events: a golf tournament each October at Heritage Hunt and The Pink Tie Charity Ball each February. For the survivors, the events are an opportunity to give back, reconnect and have some fun. Deja Vu Boutique in Mount Airy, MD, teams up with the IIIBs to donate ball gowns to survivors for the event. “We do this so woman who have suffered through breast cancer can have a night to feel like a woman again. To feel absolutely beautiful,” Rodenburg said. Lindberg says the ball is a time for survivors to be honored, but it’s also for the families who have grieved and have watched their loved ones suffer. It’s a chance for them to witness the hope and joy in their loved ones’ community of support, a connection that started with a simple gift basket. This year’s Pink Tie Charity Ball, dubbed The Beauty and the IIIBs, is 6 p.m. to midnight Saturday, Feb. 18, at the Hilton Washington Dulles Airport Hotel. The evening includes a candlelight plated dinner and open bar. All are welcome. For more information, or to donate to the foundation, go to keepthecandleglowing.org. IIIBs assemble the baskets on Wednesdays and are always looking for volunteers. Those who are interested can email Carolyn Rodenburg at carolyn@keepthecandleglowing.org.